If you are looking for a low growing ground cover plant that is easy care and drought tolerant then Banksia ‘Coastal Cushion’ (picture right) could be worth considering. 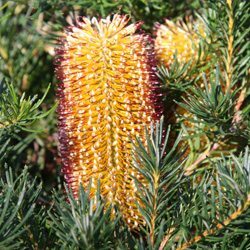 This is a low growing Banksia spinulosa variety with attractive yellow deep raspberry flowers is suitable for use as a ground cover plant. It attracts birds to the garden, has long lasting flowers and grows well in poor soils. The flowers appear as colourful spikes and in good conditions the plant will be covered with them for months. Foliage is lightly serrated and is attractive through the year. This is a compact growing plant and can be used as a feature near the front of the border, or planted en masse as ground cover plant for larger areas. It grows well in coastal conditions and can be used as a second line plant in these areas. Best in full sun with good airflow, Banksia ‘Coastal Cushion’ can also be planted in a position where it receives a little shade during the day. It does nor work well in deep shade. A form of Banksia spinulosa growing to around 0.5m Banksia ‘Coastal Cushion’ works well in a rockery in a well drained position (Full Sun is best and a well drained soil). Banksia ‘Birthday Candles’ although slightly lower growing seems to be a little more temperamental in our garden. Position – Full sun Soil – Humus rich, well drained, will grow in sandy soils. Height – To around .5 metres. Spread To around .6 metres. Flowers – Cone shaped and orange to red/brown. Foliage – Dense and Mid green.